One of the most famous dishes of Vietnam is Pho, a noodle soup, popular with locals, especially at breakfast. Going to Vietnam without eating Pho would make your visit incomplete. Indeed, it is not only a delicious bowl of soup, but pho also provides an interesting lens into the Vietnamese culture. Originally from northern Vietnam, the story of pho is intertwined with Vietnam’s history. Pho became popular in the north as a hearty soup eaten at breakfast by the rice field workers. After Vietnam’s partition in 1954 between the North and the South, and in the aftermath of the French colonization, thousands of Vietnamese migrated to the South to escape communism in the North. That’s when the South adopted pho and made it their own. The Pho from Saigon is said to be spicier and sweeter. You can read more about the Vietnamese regional differences in our previous article about the food in Vietnam. 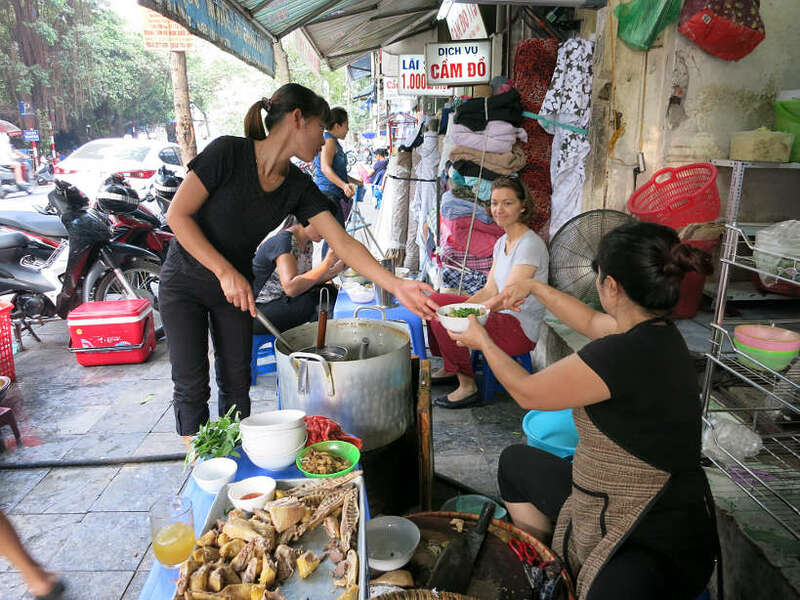 On our quest for authentic food in Vietnam, we traveled from Hanoi to Saigon (Ho Chi Minh City). 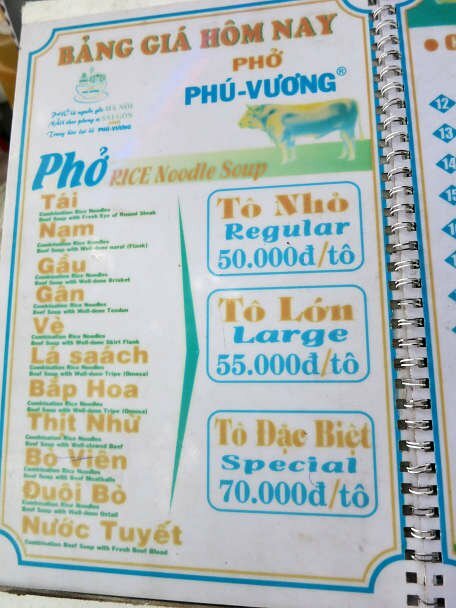 Along the way, we made a point to try pho in Vietnam and understand the regional specificities. 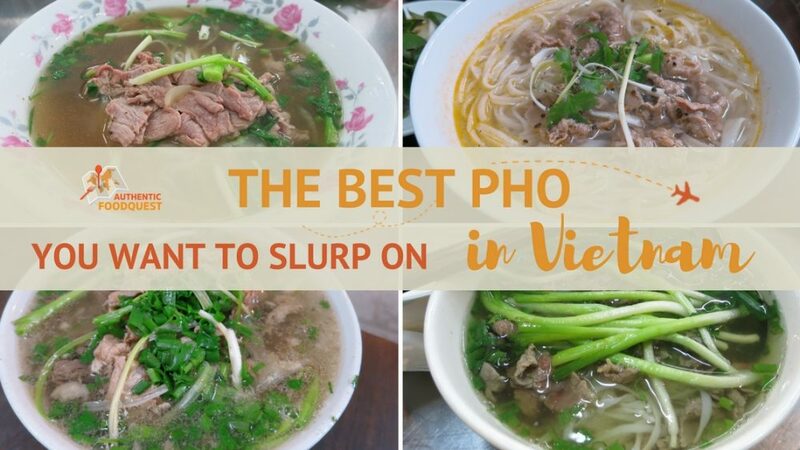 Join along for a road trip for the best local pho in Vietnam. Read on! Before we jump on the road, it is essential to understand what makes up pho. 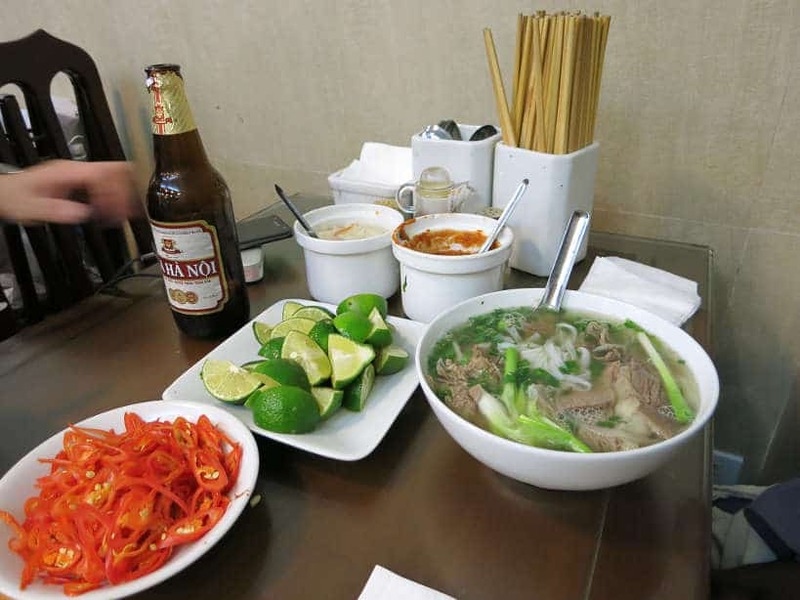 A bowl of pho is basically a soup made of a clear beef or chicken based broth with flat rice noodles, herbs including green onions, ginger, and coriander, and thinly cut slices of meat, primarily beef or sometimes chicken. 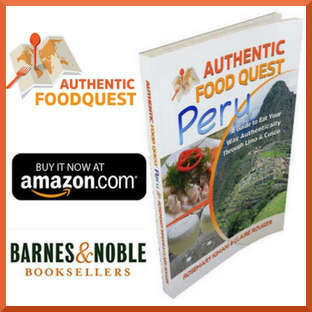 Not too heavy, it is a flavorful soup that is most commonly eaten for breakfast. Nonetheless, you will find pho served all day in Vietnam. We arrived in Hanoi at the beginning of the winter, which really means in the dry and cool season. The temperature stayed around 21C or 70F and would drop slightly at night warranting a sweater on some days. This was the perfect invitation to discover the best pho in the city! Our favorite pho was from Gia Truyen. This open-air restaurant serves pho, traditionally in the morning starting at 6:00 am and then again later for dinner until 8:30 pm. Being late eaters, we made sure not to miss our opportunity to taste the pho from Gia Truyen. 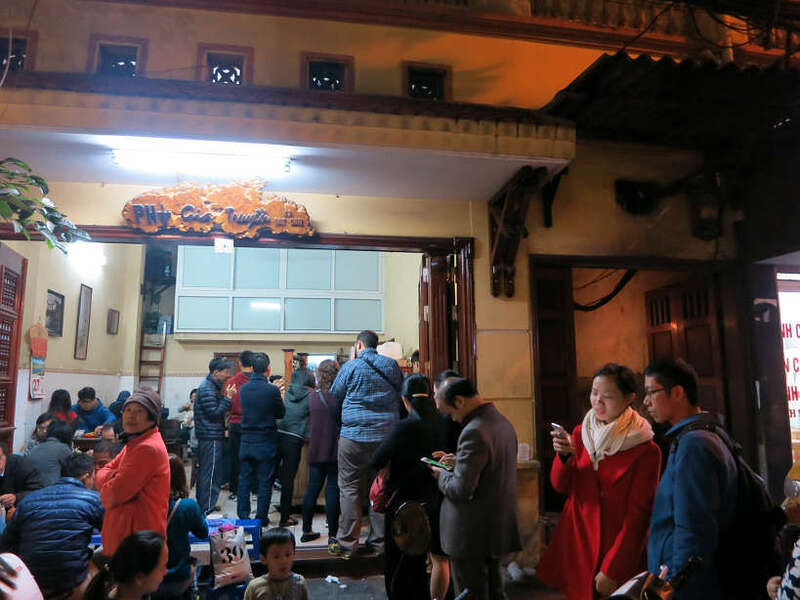 When we arrived at the restaurant, we were surprised to see so many people queuing outside waiting to get served the precious bowl of noodle soup. Tables were sprawled out inside and outside the restaurant. As soon as anyone left their spot, someone would pounce on their seat immediately. When you get to the cashier, you place and pay for your order and then take a seat and wait. Don’t mind the hunks of meat hanging on the counter. Instead, focus on all the fresh ingredients that are going into your bowl of deliciousness. Even after watching our bowls of soup being prepared, we never got to know exactly why these large meat pieces were hanging there. The pho is served with three different cut of meat you could choose from. Pho Tai which is the traditional basic pho, with slices of rare beef steak. Pho Tai Nam which is a combination of slices of rare beef steak and beef flank. And finally, Pho Chin which has slices of brisket. We tried the Pho Tai and Pho Tai Nam. The magic of pho lies in the broth and this one did not disappoint. The pho in both versions was very flavorful and filled with ginger, garlic and cilantro flavors. The meat was lean, incredibly tender and very tasty. Such a delightful and filling meal! We also tried the side of trung ga, which is banh mi style bread that is lightly fried and used to dip into the soup. An interesting add-on, though not necessary to fully appreciate the pho itself. Delicious and satisfying Pho Tai Nam. Yum! 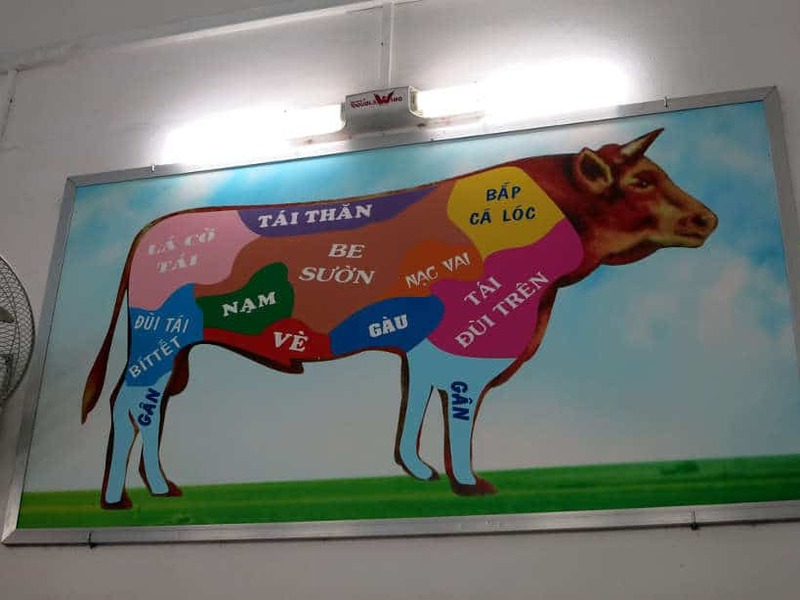 Address: 49 Bát Đàn, Hà Nội. Hours: Everyday from 6:00 am to 10:30 am and 6:00 pm to 8:30 pm. Prices: About 40,000 VND to 50,000 VND per person, approximately $1.75 USD to $2.20 USD. Although Pho is best with beef, we wanted to try the chicken version. 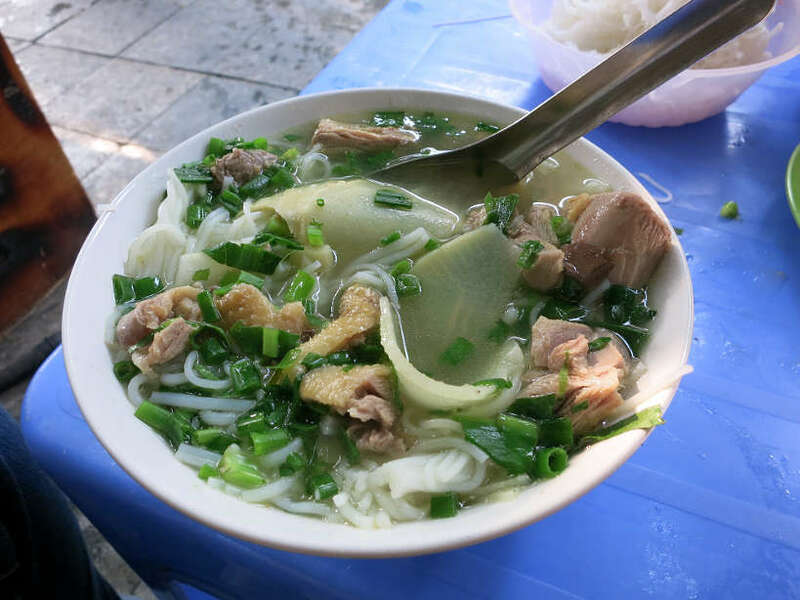 Without having done much research about where to have it in Hanoi, we stumbled onto a stall in a side street that seemed to have much success with their noodle soup. Upon getting closer we noticed that they were serving chicken pho. This was our chance to give it a try. The soup was simple and filling although we were not big fans of the chicken taste. While it was a pleasant experience, we decided to stick with the beef soup moving forward. Address: Northeast Corner of Cua Dong and Phung Hung St, Hanoi. Hours: Lunch hours 11:00 am to 2:00 pm. Price: About 35,000 VND per person, approximately $1.55 USD. 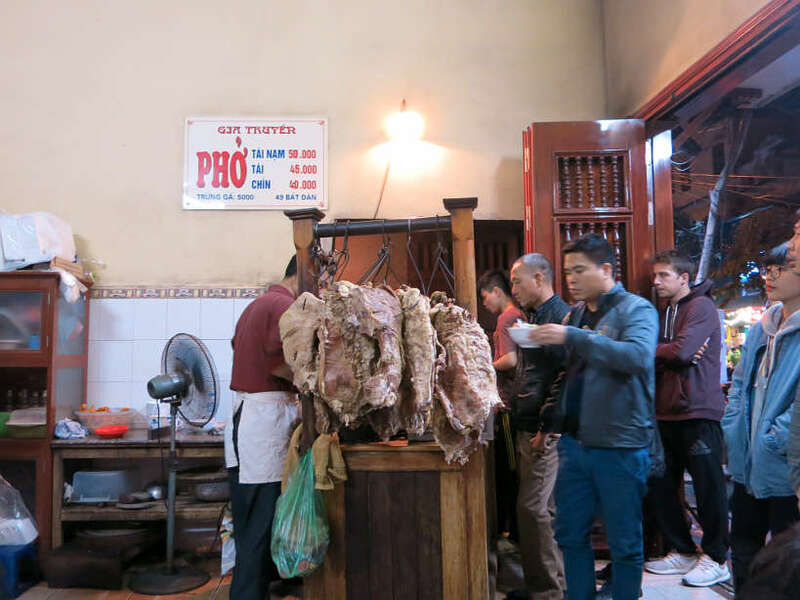 After tasting pho a few of times in Hanoi and Hoi An (central region), we went in search of the best pho in Ho Chi Minh City (Saigon) and to understand the differences between Northern and Southern Pho. There are no shortages of places for pho in Saigon. To help us decide, we asked our host at the Airbnb where we were staying, for their favorite places for pho. They recommended that we check Pho Vu Phuong a popular place with the locals. Located in District 1 and not far from Ben Thanh Market, we decided to walk there for lunch. At first glance, we were very impressed with the cleanliness of the place and the nice and comfortable atmosphere. Local office workers were finishing up their meals as we sat down at a nearby table. On the wall of the restaurant were huge boards showing the different cuts of meat. Equally noticeable throughout the restaurant were mentions of “serving 100% of beef” on the menu, napkins, and posters on the wall. As we looked over the menu, there was a surprisingly large selection of pho. 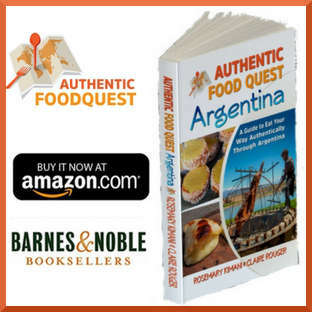 It is made with different cuts of beef including skirt steak, flank steak, brisket, and for more adventurous eaters, you have cuts like tendon, tripe, and beef blood. The pho is served in three portions, regular, large and special. We decided to go for the large portion of the Pho Tai which is served with rare round steak and the Pho Ve served with skirt flank beef. The pho broth was served with a lot of greens and with a nice onion flavor. The meat was lean and tasty though not as tender as the pho from Hanoi. We certainly enjoyed it very much and found it slightly more spicier than pho from the north. One of the best parts about the experience was the ability to choose your cut of beef. This is definitely a great place to try beef pho with your preferred cut. Address: 120 Nguyễn Thái Bình, District 1, Hồ Chí Minh City. Pho is the most iconic Vietnamese dish. You can find it easily outside of Vietnam. District One restaurant in Las Vegas, USA serves the most authentic pho we’ve had outside of Vietnam. 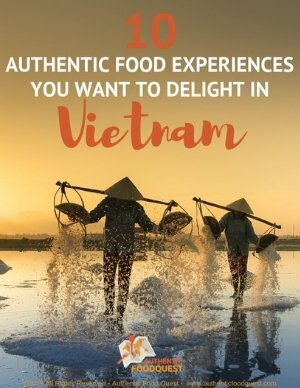 While visiting Vietnam, trying pho from it’s original birthplace in the north, all the way to the south of Vietnam, is a culinary adventure that is not to be missed. For us, the best pho in Vietnam was from Hanoi. The savory broth mixed with fresh herbs, accompanied with tender slices of beef stole our hearts and warmed our bellies. While the pho in Saigon is equally delicious, we prefer the peppery version from the north over the sweeter style in the south. 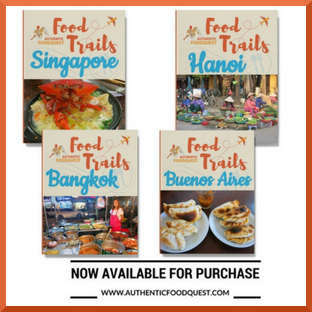 For recipes about the pho in Vietnam, Andrea Nguyen, new cookbook, The Pho Cookbook: Easy to Adventurous Recipes for Vietnam’s Favorite Soup and Noodles is a great place to start. And what you, have you had Pho before? What is your favorite Pho and where did you have it? Are you planning a trip to Vietnam soon? If so, keep this list handy. Yes, indeed the pho is spectacular!! Thanks Debra! I love a good ramen and noodle soup. All of these sound amazing! I cannot wait to try them out myself – need to visit Vietnam! Sounds like you are already a soup lover. Given that, a trip to Vietnam for the pho is a must. Delicious soup and incredible food all around. Amazing!! Hope you can visit soon. Thanks for stopping by. Pho is one of my favorite foods. I remember the first time I had it was in Montreal’s Chinatown. It’s a bowl of food that made me think, ‘Why haven’t I had this before’. Late, I went to Vietnam for 2 weeks and loved getting to see the differences in Pho. I agree that the broth in the north, though from the clear appearance, packs more beef and pepper flavor, while the south introduces star anise and other spices to create a more aromatic product. The good news is that either way, it’s hard to get a better bowl of food than some pho on the streets of Vietnam. Thanks for bringing back some tasty memories! Love your comments Drew. The differences in the pho in the north and south are subtle but noticeable. Did you have a preference for what style you preferred? Regardless, as you mentioned, you can’t go wrong with a bowl of pho in Vietnam 🙂 Cheers. That’s wonderful that you are a pho lover as well. Have you had it in Vietnam? The whole experience of sitting on the little stools, surrounded by locals slurping down the soup is surreal. Hope you can get to Vietnam soon and enjoy it for yourself. Thanks Rachael for your comments. I love Pho! I think I consumed my body weight in the delicious noodle-y broth when we were in Vietnam, it was so much fun adding in the pickled ginger, garlic and chilli and whatever other condiments were on the table! But I have to say, I did prefer Chicken Pho to Beef Pho. That’s interesting that you preferred the chicken pho, over beef. I guess it is a matter of tastes because we preferred the beef. Regardless, pho in Vietnam is incredible and you will not go wrong either way. Thanks Vicki Louise. I’ve never had an authentic bowl of pho! Looks like I’ve been missing out! Once you’ve had a good bowl of Vietnamese pho…no other soup can live up to that 🙂 Hope you can taste one for yourself soon!! Cheers, Joscelyn. I have never had pho anywhere. Something I should try, but I always hear great things about it. Hi Holly, you would love pho, especially in Vietnam. If you are not planning on traveling there soon, try it out at a local Vietnamese restaurant. You will not be disappointed!! Cheers. Yummy yummy yummy! Like the poster above me, I’ve never had pho before, but these photos are very enticing! I gotta try it! Yummy, indeed….pho is certainly worth trying. Check out your local Vietnamese restaurant for a start and then add Vietnam on your travel list 🙂 Cheers, Rachel. Wow interesting post! A lot of awesome information! Glad you enjoyed the article Liv. Have you had pho before? Cheers!! That’s awesome that you have delicious Vietnamese food in Barcelona. Yes, I’m sure it is slightly different than what you would find in Vietnam. The range offered in Vietnam is certainly more expansive, especially the regional delights. Glad to know you are already a fan of Vietnamese food. A trip the country is definitively worth it 🙂 Thanks for stopping by!! Oh gosh! This looks divine!! I have never had anything like this before!! Add that fried bread… you got me! 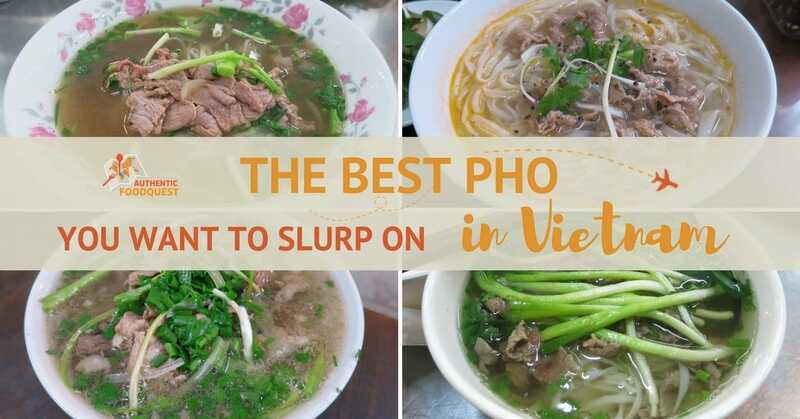 Awesome to hear that the Vietnamese pho soup has your slurping for more….It truly is divine. I hope Vietnam is on your travel agenda…because you will be richly rewarded!! Cheers and thanks for stopping by. Oh my goodness! I want a bowl of this right now. We love Pho and this looks so delicious. If only I could escape now to get some! Haha. Thanks for sharing. Indeed Vietnamese pho is incredibly delicious. If you can’t sneak way to Vietnam, your best bet is your closest Vietnamese restaurant 🙂 Check it out and let us know what you think 🙂 Cheers. Its crazy how cheap things are over there! I’d love to make it to Vietnam one day! Indeed the prices in Vietnam are very affordable. And the best part is the food is incredibly tasty and fresh. Do add Vietnam to your travel list and prepare for a full cultural immersion 🙂 Thanks for stopping by Ginger Marie. Yum! I’ve never been to vietnam, but I do love Pho! Indeed, pho is delicious Vietnamese soup. If you can, a trip to the country of origin of this delicious soup is worth it 🙂 Thanks for stopping by. You’re so lucky! I want to go and have some pho! Great comments Rob and Ann, the loyalty to either the North or South does run deep. 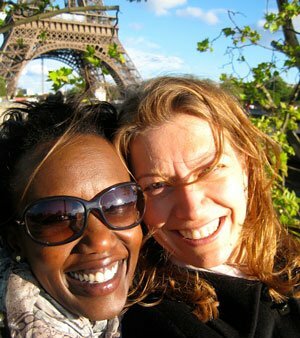 For visitors to the country, the differences must be explored. Agree, in the end, it’s all about that delicious beefy goodness. Thanks for stopping by!! The first time I had pho was in Texas. It always seems like the perfect meal when you’re battling a cold lol! I’d obviously love to try it in Vietnam though. It’s interesting to see how different it can be depending on the region. And I especially like the option of choosing your cut of beef. That’s interesting that you first had pho in Texas? You are right, the perfect meal for a chilly night or when battling a cold 🙂 I’ve never had it in Texas, but I can certainly vouch for its deliciousness in Vietnam. Indeed, choosing your own cut of beef is a nice touch. Thanks for stopping by!!! Awesome to read. So glad you enjoyed the article. Indeed, do keep the page handy for your future trip. Feel free to reach out with any questions as well. Cheers! Thanks so much Jenn and so glad to “virtually” connect with another pho fan. Hope you can make it to Vietnam soon to enjoy the soup there as well as taste the regional differences. Happy to have made you “drool” 🙂 Cheers. I’ve only tried pho once and it was in London. They made me wear a bib and I was very grateful 😉 I’m sure it’s even more delicious in Vietnam! Thank you for the suggestions and happy travels. Lucky you Rachel for having family who can make you home cooked pho at any time!! Do you have any good recommendations for pho in the US? The differences are subtle, but regardless, pho from the north or south is delicious. Appreciate your comments, Rachel. 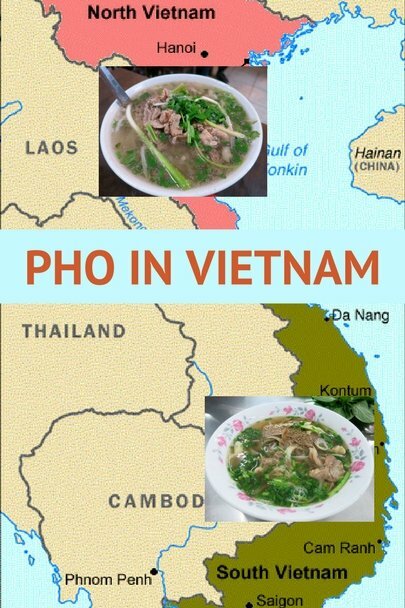 What great info, I never knew there were regional differences in Pho recipes. I haven’t gotten the opportunity to travel to Vietnam yet, but it’s on my bucket list. When are you planning your trip Amanda? Do let us know if we can provide any additional tips. 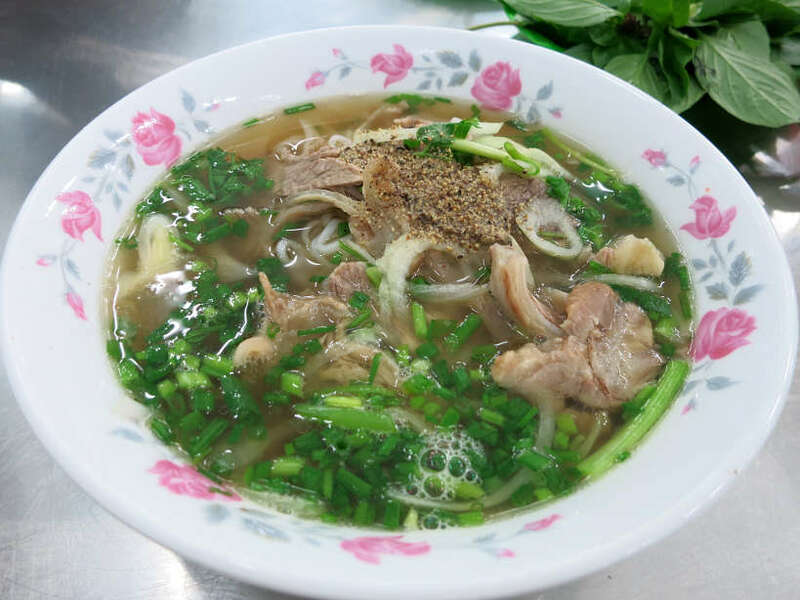 Exploring pho in the different regions of the country will be a delicious treat. Do report back and let us know what your thoughts!! Thanks for stopping by! Great timing as we are off to Vietnam in a few days and we love pho. Perfect Paula. What part of Vietnam? Do let us know what you discover about pho and the food in general. Safe travels!! Reading this post makes me soooo hungry. I miss Hanoi and their Pho! How I wish I could come back soon! This food is soooo good! Thanks Cai. Agree, the pho in Vietnam is simply amazing. 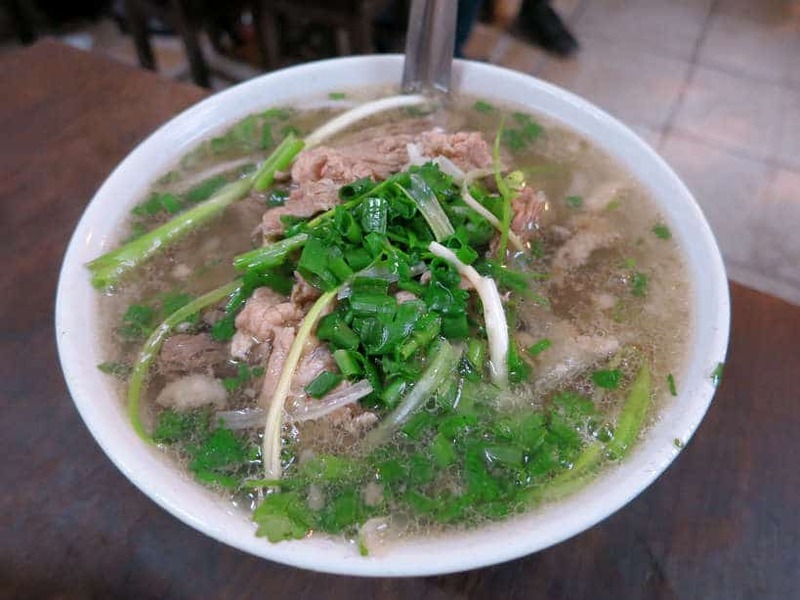 Did you find a favorite place for pho in Hanoi that you liked? Do let us know. Thanks for stopping by. Thanks Albert, so glad you enjoyed reading the article. 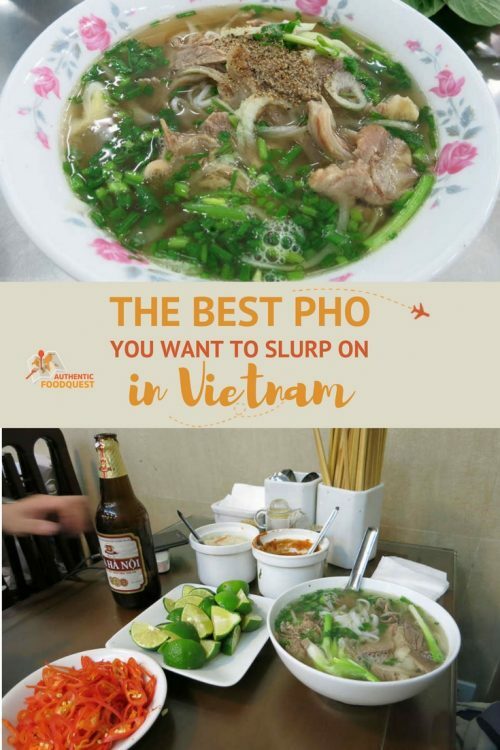 Definitely, seek out pho on your trip to Vietnam and see if you can taste the subtle differences across the country. Thanks for stopping by. Looks delicious. 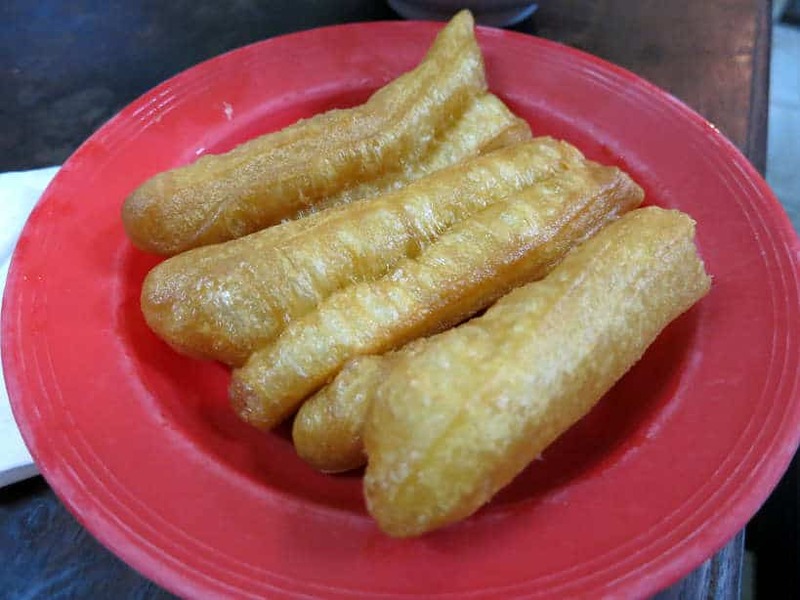 By the way, the fried bread is actually called Dau Chao Quay or just Quay. Trung Ga is chicken egg, if you order that at a pho place, you’ll get a small bowl with an egg yolk in broth. Awesome…and thanks for the updates. All versions of pho are incredibly delicious…though we liked beef the best 🙂 Thanks for stopping by! Awesome! Thanks for the tips. We’ll be back in Hanoi soon and will keep this place in mind. Cheers. Thanks Coconut, we’ll follow up separately via email 🙂 Cheers. Informative & well explained article. Great tips. Thanks for sharing such an valuable article. You are most welcome Jennifer. We are happy to provide any additional information you may need. Just reach out. Cheers.